PORT OF SAN DIEGO: It was the big winner of AAPA’s 2018 environmental awards. AAPA’s 2018 IT award winner for port operations and management systems is the Halifax Port Authority. AAPA’s environmental awards have recognized activities that benefit port environments since 1973. The Port of Hueneme won AAPA’s comprehensive environmental program award. 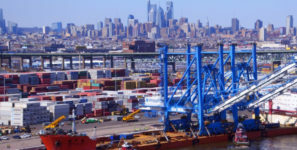 The American Association of Port Authorities (AAPA) has announced the winning entries into its 2018 Environmental Improvement and Information Technology awards competitions. Winners were honored at AAPA’s 2018 Energy and Environment Seminar in Jersey, City, New Jersey, on September 12. The winner of the 2018 information technology awards program will be honored at AAPA’s information technology committee meeting in Halifax, Nova Scotia, Canada, on September 26. Since 1973, AAPA’s environmental improvement awards program has recognized activities which benefit the environment at its member ports. This year’s awards program had winners in all four project entry categories: environmental enhancement; mitigation; comprehensive environmental management; and stakeholder education, awareness, and involvement. The award-winning entries in both the 2018 environmental improvement and information technology competitions, together with the 25 ports that submitted successful entries in AAPA’s 2018 communications awards program (announced in June), are posted on the AAPA website.